It’s pouring in Northern California today. I mean torrential downpour. Like hide under the covers all day kind of weather. Like make hot tea and pet the puppy and don’t do anything else because the power might go out at any instant. Geez. Weather. Being stuck indoors calls for some creative cooking. You’d have to pay me to go to the grocery store right now. Gotta make do with what I have. Maybe necessity is the best form of innovation…and onion marmalade is the best solution for being stuck inside on a rainy day with nothing but onions in the pantry. This marmalade is sweet and spicy and tangy and onion-y and damn good. I didn’t seal one of the jars just so I could eat it fresh after cooking. Once this jells up in the jar in a few weeks it’s going to AMAZING on burgers or grilled meat and veggies. Dynamite with cheese on a toasted baguette. Downright naughty with some crumbled bacon over eggs. Drooling. This is a pretty simple canned food to make, so don’t be intimidated that the recipe has a lot of steps. Just pay attention and go in order. You know how to do that, right? I try not to ask too much, I promise. An advantage of this recipe is it’s adjustable in terms of flavoring. We love adjustable! You can make it with a little bit more or a little less garlic, more or less spice and incorporate some dry spices like curry or cumin if you like. Pretty much any spice goes well with onion so you can really customize this one. Wash 7 half pint canning jars and keep hot until needed; prepare 2 piece canning lids as manufacturer directs. Peel onions then cut into strips about 1/4″ thick, 1″ long by quartering. Prepared onions should measure 7 cups. 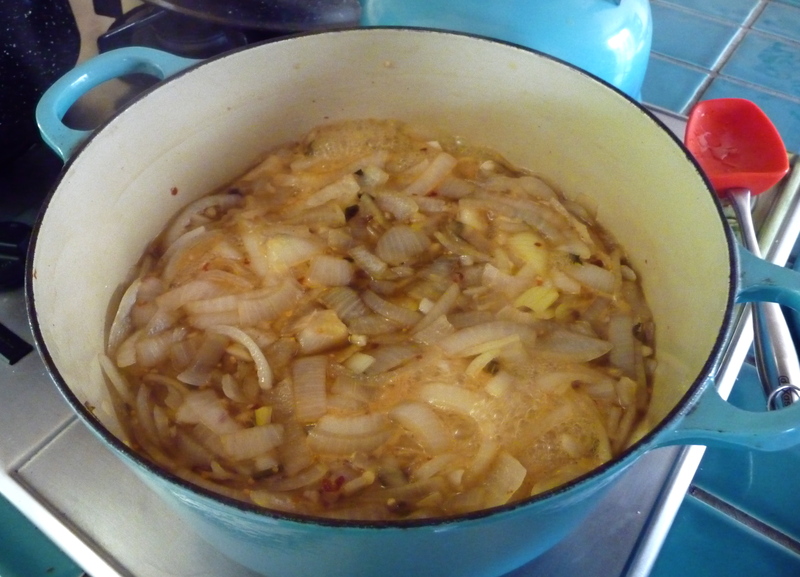 Place prepared onions in a heavy bottomed pot. Stir in apple juice, vinegar, garlic, sage, salt, pepper, mustard and pepper flakes and mix thoroughly. Measure granulated sugar into a bowl then remove 1/4 cup and set aside in a small bowl. To the larger amount of granulated sugar add brown sugar and mix. To the 1/4 cup of granulated sugar stir in the pectin. Stir the pectin sugar mixture into the onion mixture in the pot then add butter. Place pot over high heat then bring mixture to a full rolling boil stirring constantly. Immediately stir in the remaining sugars. Bring mixture to a full rolling boil then boil for exactly 5 minutes stirring constantly.Remove from heat and skim off foam if necessary. 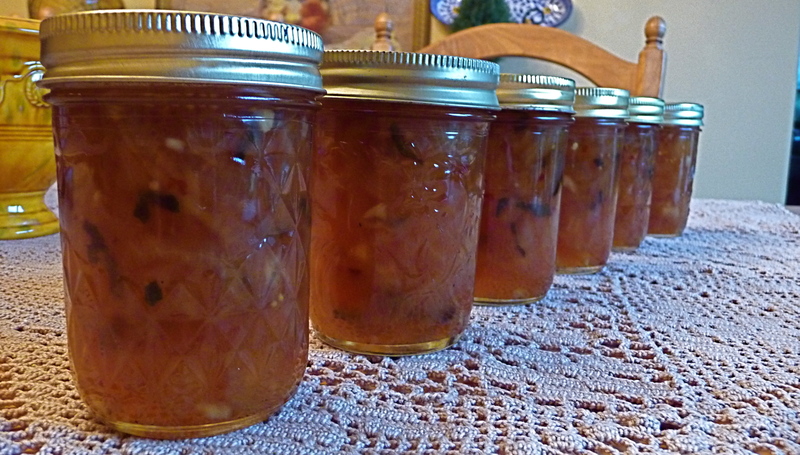 Ladle hot marmalade into 1 hot jar at a time leaving 1/4″ head space. Wipe jar rim with a clean damp cloth then attach lids. Fill and close remaining jars then process in a boiling water canner for 10 minutes. Remove and let cool overnight on the counter. Lauren – did you make the marmalade? How did it go?